Our original Eh-Frame tents are designed to be the perfect tent solution for outdoor adventurers in the Canadian backcountry. 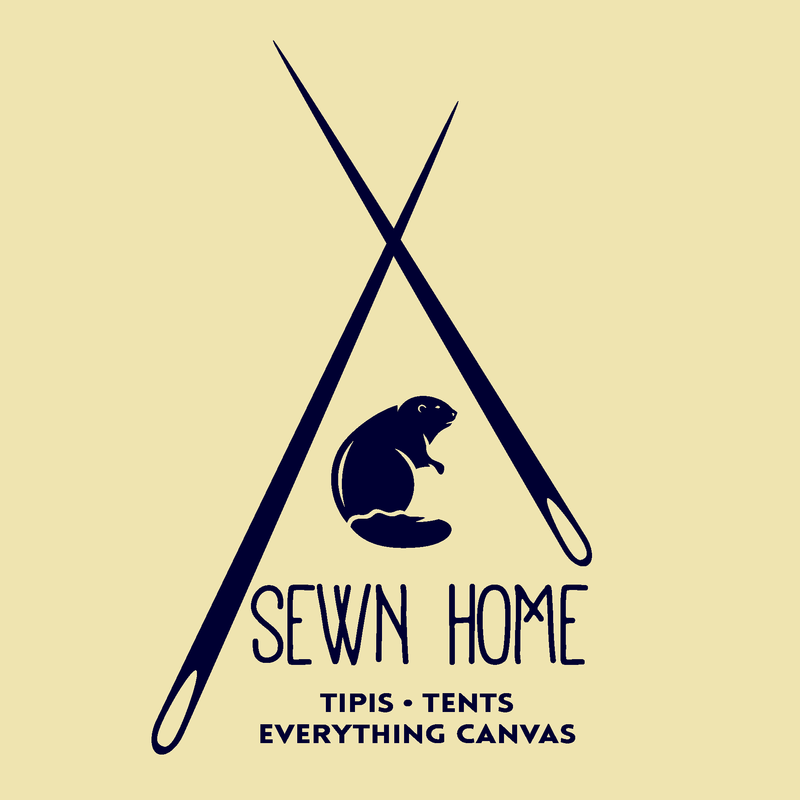 This is a simple, affordable, mid-weight tent with a strong, 5-pole, break-down frame. 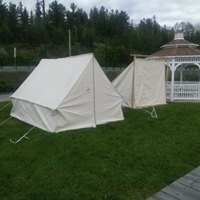 We design and build these tents to withstand harsh Canadian weather in all seasons. 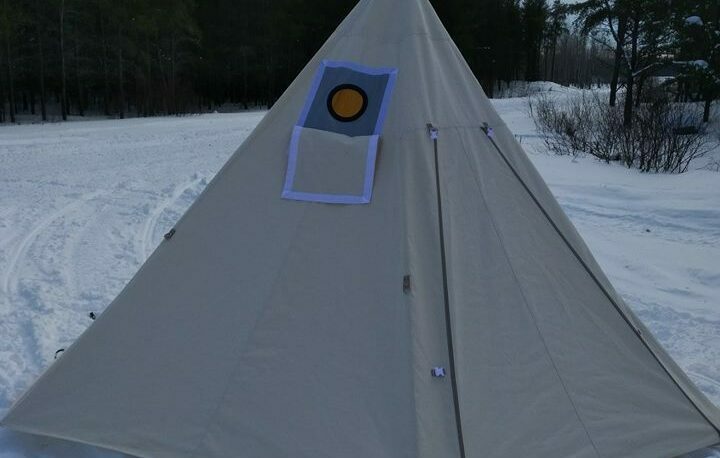 Baker tents are an iconic piece of gear in the canoeist community. 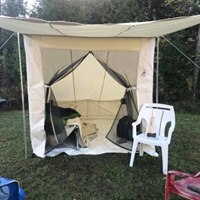 They are lightweight, versatile tents that lend themselves well to bushcrafters and backcountry travellers who want to put a minimal amount of material between themselves and the outdoors. 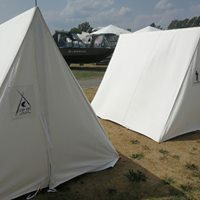 These tents are also an excellent choice for festival vendors wishing to have a beautiful display with plenty of walled-off storage and possible sleeping space. 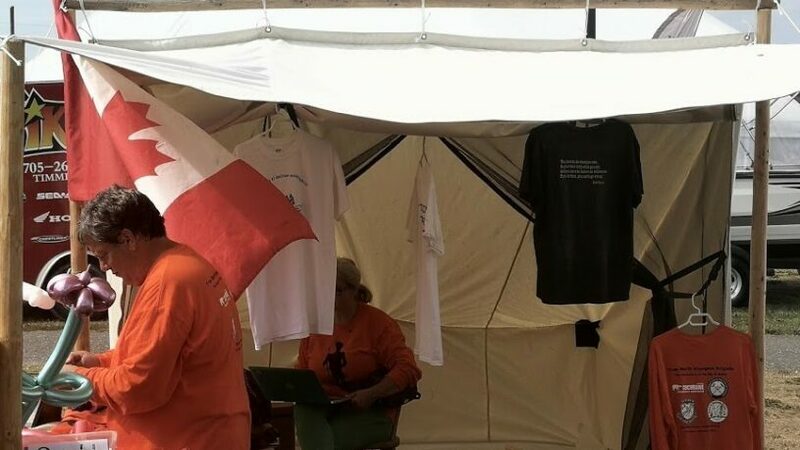 In a typical baker tent, the awning doubles as a privacy door-flap when needed, but in many of our baker tents, we add on a roll-up zippered canvas front wall for added ease and comfort. Water-proof floor tarps are also a popular add-on. 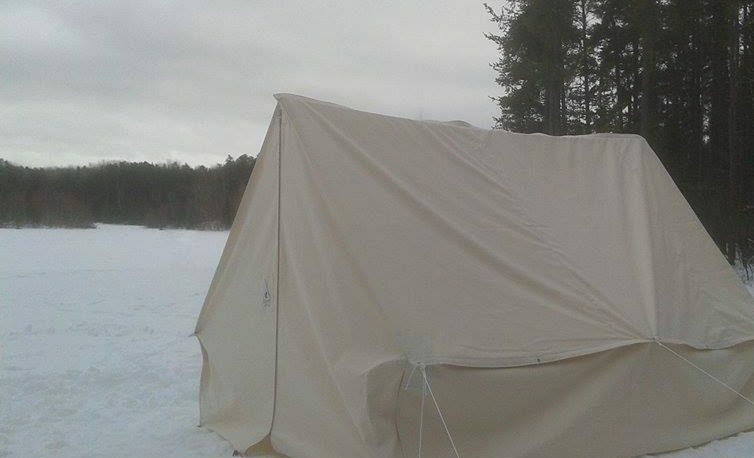 We can provide break-down aluminum poles, wooden poles, or you can hang your tent to a frame of your own making. Our Aluminum poles break down, are shock corded and made of 7/8” tubing to stand up to abuse. Our wooden poles are made of douglas fir or tamarack for their natural rot resistance and strength. There is nothing quite like camping in a Baker tent. It’s a unique blend of being indoors and outdoors that just feels right. Quadruple reinforced stainless steel grommets to attach to your poles. Stake loops along the bottom. 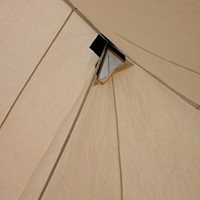 Center Pole tents are a minimalist option in terms of set up and pack weight. You only require one pole which can literally be anything,from our 3-piece break-down aluminum poles to a sturdy stick. These tents trade in head room for low-weight and simplicity. 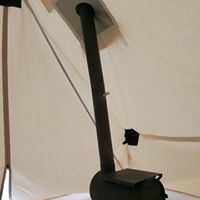 A standard center pole tent comes with a single zipper door, a heavily reinforced peak, sod cloth, stake loops and stove jack. Our standard Center Pole tents have a hexagonal shape which we find to be the most space efficient shape and allows for an easy set-up. Our sizes refer to the distance from one outer corner to the opposite corner. For added head room, we can add an 18” side wall. While this you more usable space, it sacrifices simplicity as the walls must be securely pulled out with guy lines. 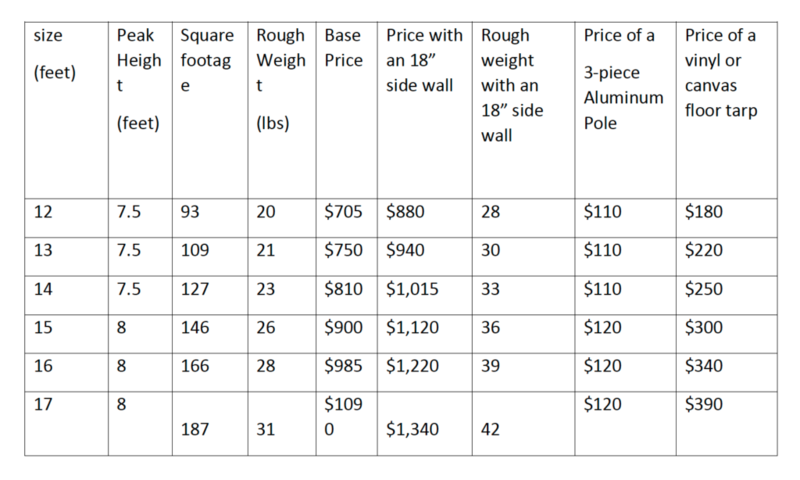 The price of adding side walls and stainless steel D-rings for attaching guy lines is shown in the chart below. Note: any custom shapes and sizes are possible, so feel free to contact us about any other dimensions or style of center-pole tent. 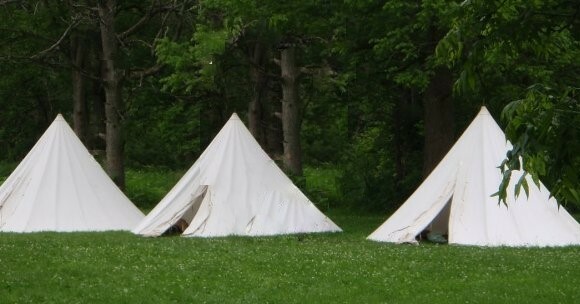 Wedge tents are likely the simplest and one of the oldest styles of tents you can find. 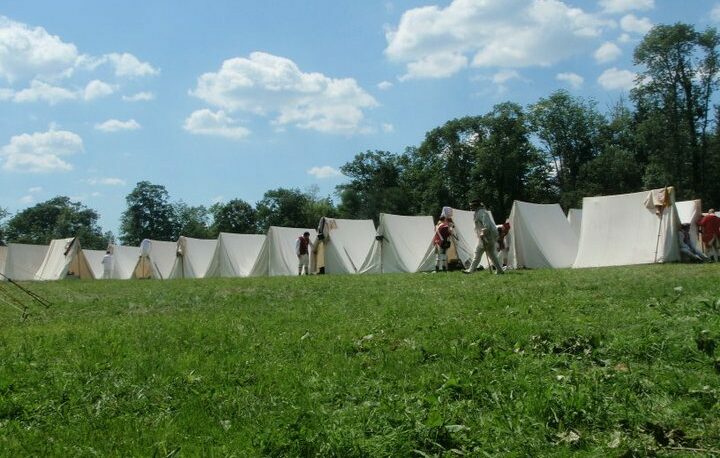 These are standard lodging for 18th-19th century reenactment. 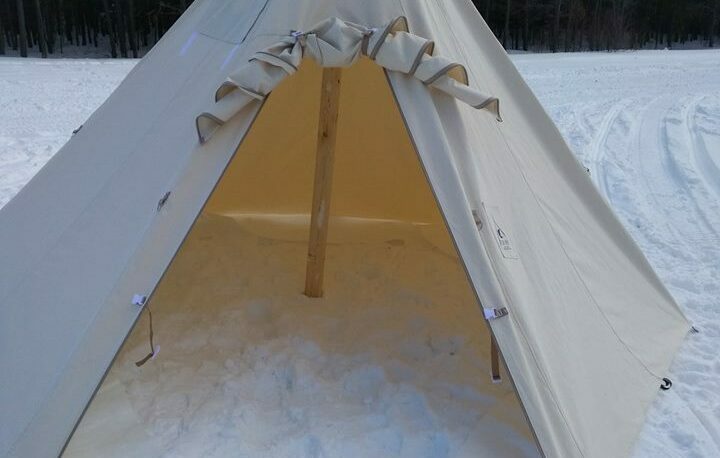 Our standard wedge tents are well reinforced but have no visible modern materials and feature an overlapping tied-flap door on both ends. A set of poles includes two uprights and one ridge pole. Poles are made with douglas fir or tamarack with stainless steel hardware.To make your poles easier to transport, we can cut them in half and include steel sleeve joints. 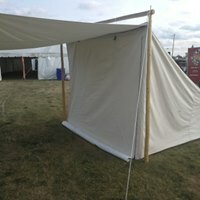 Pricing for these tents is shown below with and without poles. Custom sizes are no problem at all.